After an impressive unveiling of the Brera and 159 at the Geneva Salon, interest is rising in the next batch of models which are set to complete the new Alfa Romeo range. 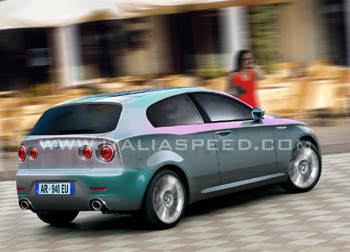 Now firmly under development, the Alfa Romeo 147 replacement will be the next new addition to the family, scheduled for launch in late 2006. As with the Brera and 159, a no compromise package is expected, offering the highest level of quality, combined with elegant lines and a sporty heart. No pre-production prototypes of this new sporty hatchback have yet hit the road, with the final body design still undergoing a feasibility study at Elasis. As soon as the final body design has been chosen, and the dimensions fixed, Alfa Romeo traditionally outsource the fabrication of ‘mules’ to engineering companies such as Stola, where current production models are professionally modified and fitted with prototype technical components. In the case of the Alfa Romeo 147 replacement, internally code-named as ‘Progetto 940’, there have been reports that mules are already on the road, testing the new underpinnings. Technically, Progetto 940 will represent the first Alfa Romeo to be fitted with the new Compact platform. Valuable test data on this platform has already been gathered with the Alfa Romeo Kamal project having been fitted with the same platform during its previous development phase. Several platform test mules were constructed using Fiat Stilo Multiwagon shells, and trialled around Balocco and the demanding Nürburgring test track. The results were promising, with the prototypes displaying excellent handling characteristics. Despite the limited information flow at this early stage, Italiaspeed can already offer an impression of what the exterior design will look like. Several sources have confirmed the styling of the car, in particular stressing the well executed combination of sharp and round shapes. Design features from the Alfa Romeo 8C Competizione have been used to create a unique rear end. The rear wheel arches will be well emphasized, in accord with the latest trend in automotive design, as seen on the Alfa Romeo Brera and 159, as well as other makes such as the new Mercedes-Benz S-Class. 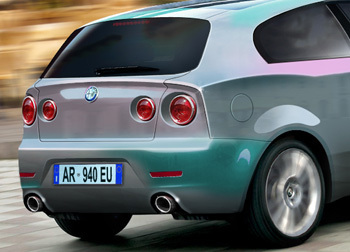 As with the Alfa 159, twin exhaust pipes are expected on the high power versions of the Alfa 147 replacement. A tall grille will dominate the face of the car, extending from the bonnet to the bottom of the bumper. The remainder of the lower bumper design will feature large open sections, whilst the front lights will be similar to those used on the Alfa 8C Competizione concept. The harmonious combination of elegance and aggressiveness simultaneously portrays the new direction of Alfa Romeo vehicles, sporty, yet comfortable, an unrivalled combination of both. The new Alfa 149 hatchback will therefore present a totally different face and rear end treatment to that of the 159 and Brera, whilst remaining within the boundaries of the new styling direction in terms of surface treatment. A wide choice of motorisations will be offered, with a new 120 bhp 1.6 litre diesel engine fitted with Multiair variable valve actuation being the most interesting of the range. This new engine serves as a replacement to the 8 valve 1.9 litre JTD engine, displaying the same power output, with substantially reduced emissions output and fuel consumption. Two more engines are expected to complete the diesel range, including a 150 bhp 1.9 M-JET. Whether a high power variant of the 1.9 litre will feature, as indicated late last year, or the new 2.4 litre 5-cylinder is still as yet unknown. The base specification petrol engine will be a 1.6 litre, with 115 bhp, an ideal choice for inner city use. A 135 bhp version of this engine will also be offered, whilst a 2.2 litre JTS, and 3.2 litre V6 will serve the top of the range.